My humidifier say it’s 25%? I’m confused on how , my temperatures are correct and I’m using coconut husk fiber mixed with green moss , and I misted today , any suggestions why this might be happening. Also water bowl is big . Are you using a tank or tub or other? What are you using for heat? By humidifier, do you mean a hygrometer? Are you using an analog hygrometer, or a digital one? Oh my bad hydrometer sorry , and a glass tank , I have a daylight heat bulb that puts the hot side to 88-90 almost 100% of the time , and for night time a heat pad , and it’s analog but even if digital I don’t think it should be that low , I’m not sure how much I should most the tank also ? Analog is not always reliable. Switch to digital as you will get much more accurate readings. Your humidity should be around 60%, and it sounds like you have done a lot for your humidity. How is your snake doing, as having a faulty hygrometer can lead you to make the enclosure too humid, which leads to scale rot and possible infections. Analog hygrometers and thermometers are notorious for giving false readings. They can be off by 10-20%. This would make sense if your humidity is actually at 40% and being read at 25%. Almost every experienced keeper here would suggest you switch to a trusted digital brand. AcuRite is one that is accurate, widely used and fits into most budgets. Glass tank + heat lamp will also zap the humidity out of the tank, but sometimes that's just what happens. If you haven't already, you can try covering the screen top with tin foil, plexiglass, or a damp towel to trap humidity, and cut a slot for the lamp. Misting is a great way to up the humidity, but ideally you don't want the enclosure to be wet all the time. An enclosure that's wet 24/7 can cause scale rot and other problems. Seems like you're doing good with the right substrate. That stuff holds humidity well. My suggestion is get a digital hygrometer/thermometer and if it still is showing up low then modify the tank further to hold in humidity or switch to a tub (which holds humidity extremely well compared to tanks). Last edited by 55fingers; 01-10-2019 at 01:20 AM. Analog readers are not accurate at all at least in my experiences, I bought a crested gecko start-up kit and the first thing I did was throw the analog combo meter still in its package away. Psst...Pangea is a great source for reptile supplies they ship almost as fast amazon prime without the guarantee. Amazon will have a good amount available too but I cannot verify their quality. 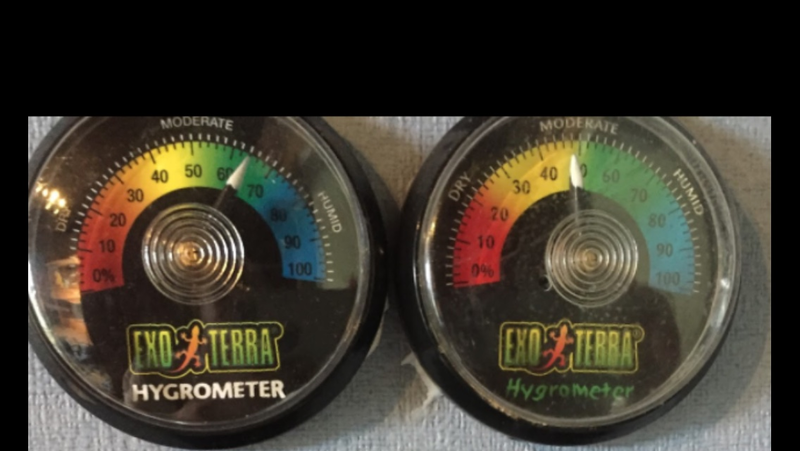 Once you snag a reliable hygrometer/Combo meter Let us know how it all works out You might have trouble with sustaining humidity levels but a lot of us here have some nice tips for you if you would like. But all that starts from getting the proper tools. Keep us informed we are here to help! Are you using something like this ?